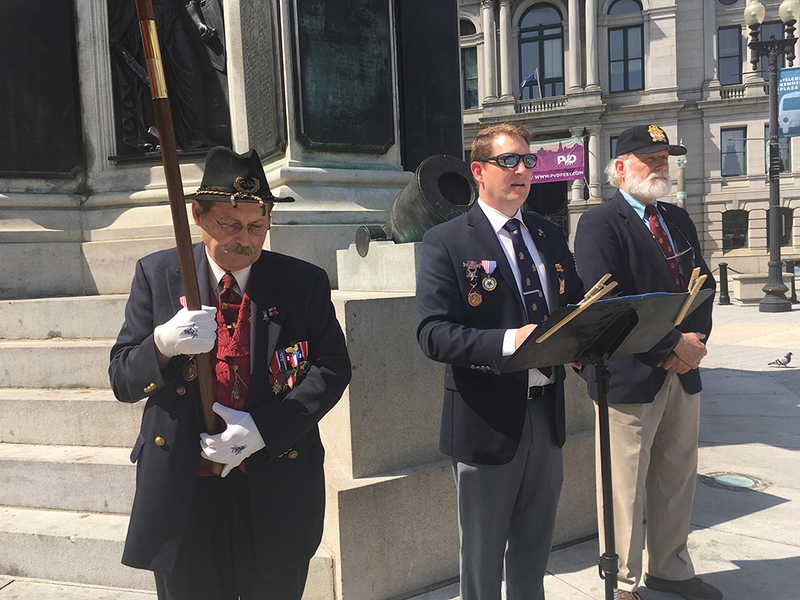 On May 30th, members from the Rhode Island Sons of Union Veterans of the Civil War (RISUVCW) marked the 150th anniversary of the founding of Memorial Day with a small, touching ceremony at the Soldiers & Sailors Monument in Kennedy Plaza. 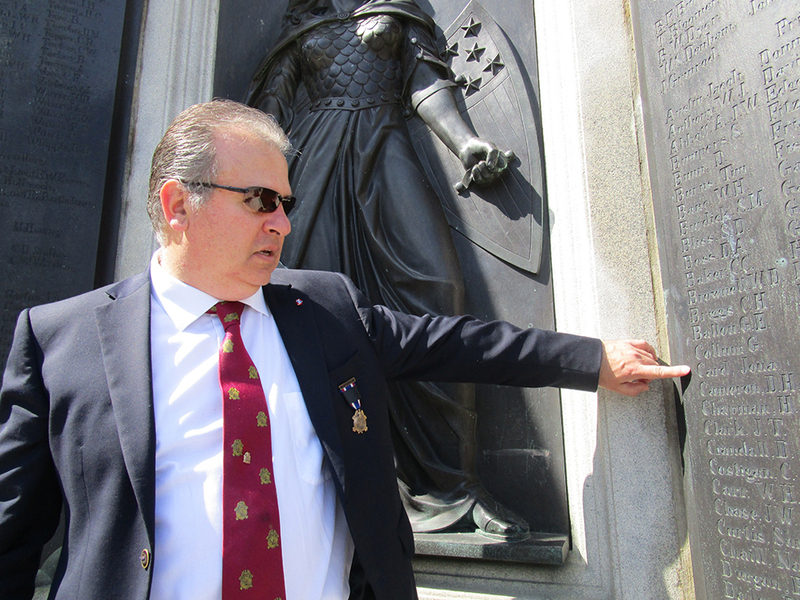 The RISUVCW has been a valuable partner in the DPPC’s Soldiers & Sailors Restoration Project. Their Department Commander, Jamie McGuire, reached out to us when he first learned of this project, and has become instrumental to our efforts. Jamie, his colleagues, descendants of soldiers whose name are on the monument, gathered to listen as Jamie read aloud the General Order which established Memorial Day, or Decoration Day as it was originally called. I. The 30th day of May, 1868 is designated for the purpose of strewing with flowers or otherwise decorating the graves of comrades who died in defense of their country during the late rebellion, and whose bodies now lie in almost every city, village, and hamlet churchyard in the land. In this observance no form or ceremony is prescribed, but posts and comrades will in their own way arrange such fitting services and testimonials of respect as circumstances may permit. We are organized, comrades, as our regulations tell us, for the purpose, among other things, “of preserving and strengthening those kind and fraternal feelings which have bound together the soldiers, sailors and marines who united to suppress the late rebellion.” What can aid more to assure this result than by cherishing tenderly the memory of our heroic dead who made their breasts a barricade between our country and its foes? Their soldier lives were the reveille of freedom to a race in chains and their deaths the tattoo of rebellious tyranny in arms. We should guard their graves with sacred vigilance. All that the consecrated wealth and taste of the nation can add to their adornment and security is but a fitting tribute to the memory of her slain defenders. Let no wanton foot tread rudely on such hallowed grounds. Let pleasant paths invite the coming and going of reverent visitors and fond mourners. Let no vandalism of avarice or neglect, no ravages of time, testify to the present or to the coming generations that we have forgotten, as a people, the cost of a free and undivided republic. If other eyes grow dull and other hands slack, and other hearts cold in the solemn trust, ours shall keep it well as long as the light and warmth of life remains in us. Let us, then, at the time appointed, gather around their sacred remains and garland the passionless mounds above them with choicest flowers of springtime; let us raise above them the dear old flag they saved from dishonor; let us in this solemn presence renew our pledges to aid and assist those whom they have left among us as sacred charges upon the nation’s gratitude—the soldier’s and sailor’s widow and orphan. This General Order reinforces the importance of our community’s responsibility to preserve the Soldiers & Sailors Monument. You can learn more about this monument, its importance to our public spaces and our project to restore the monument in this short film made by Jamie, Public Memory/Public Spaces. With voices from Senator Jack Reed, Mayor Jorge Elorza and documentary film maker Ken Burns, we hope this film will inspire you to become a part of this project by making a tax-deductible contribution today.